Eli is in remission after a battle with retinal blastoma that included 12 weeks of chemotherapy that cost him his hair, and five weeks of radiation and surgery on a tumor that cost him an eye “is watched â€œvery closely” by his doctors, said his mother, Casie Haley, 34. “He struts through like he owns the place,” Haley said. Haley, who is self-employed and works part time at home, said she and her family & husband James Haley, 34, and children Ayden, 8, and Joseph, 6, remained positive throughout Eli’s diagnosis in December 2012 and treatments that followed. And now their home in the Benson area has received some treatment of its own: a free extreme makeover courtesy of Omaha’s Elite Exteriors. 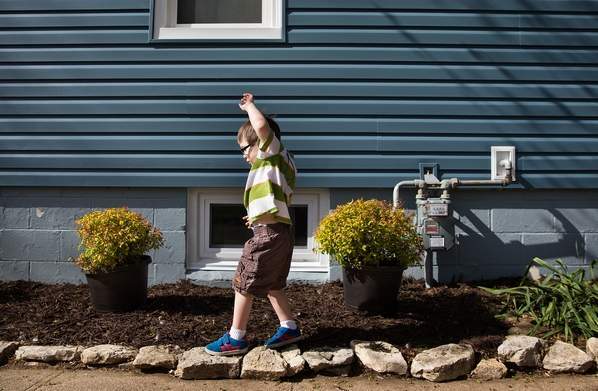 Their 1½-story, three-bedroom house was neglected during Eli’s cancer battle, so Elite Exteriors stepped up this week with free custom vinyl siding, windows and sills, gutters and doors. Deck repairs and some landscaping also were included. The business heard of the Haleys’ plight through Eli’s grandmother, Cindy Holloway. “It seemed like a nice opportunity to give back,” Krisy Lemons, office manager, said about the $15,000 in materials donated by ABC Supply of Lincoln and $10,000 in labor by Elite Exteriors workers. Lemons said the total makeover price was somewhere between $50,000 and $60,000. Elite owner Rich Davidson has put up the family at a Mahoney State Park cabin since work began Monday.